This is Instagram’s wonderful approach to make the web a truly "global village". Instagram remains one of the top social media platforms every social media enthusiast will revel at and love having in his or her apps' collection as it allows users to easily share their pictures and videos with friends and followers. Instagram believes their products and services should be accessible to all categories of people who utilise them irrespective of their conditions. This will richly impact their user based as social media experience becomes more enjoyable. This can be seen as a step ahead of some other platforms, even though a few others have long been using web accessibility features to aid impaired users. You can find out how to add or edit alt texts on Instagram images here. An alternative text, sometimes called alt text, is a feature mostly used by Web designers to enhance how images on the Web are read and interpreted. This feature, which is usually a text attached to the attribute of an image in HTML (Hypertext Markup Language), displays in the place of an image in the event when a picture on a website fails to display. This generally adds more meaning to the image and help web users understand - to some extent - what the image will have represented had it displayed. As perceived by Search Engine Optimisation - SEO -experts, this allows Web designers and bloggers to improve the on-page experience of search engines on websites. It contributes greatly, in addition to other factors, on how web contents rank Search Engine Result Pages. However, Instagram has a different plan for the use of this feature - not SEO, but accessibility to its over 285 million impaired users. They intend to rely on the strength of this feature to boost the overall representation and meaning of images uploaded and shared by users across the platform. The web is not only used by you. There are other persons who do not have the opportunity to use web resources they way some of us do. Therefore, a means must be devised to aid them in enjoying the resources and services of the web just like everyone else. For instance, people who are visually impaired need a better way of accessing texts, videos, pictures, among other possible web resources. So, for Instagram, Alt text will serve as that accessibility feature targeting visually impaired users. This does not imply that by adding an alt text to an image, a visually-impaired person user will be able to detect the image. Rather, it allows screen readers to interpret an image using the alternative text, but not from the graphical point of view. This will allow them to understand the message or concept of an image. Let's assume you uploaded a picture displaying your recent visit to a cinema, the alt text might be A visit to Ventura. Screen readers will read this out and the user will immediately understand that the picture contains information about your visit to Ventura. The picture on the right shows the shows how the alt text works on webpages. Instagram introduces two major approaches – machine learning and alternative text - towards enhancing access to pictures and the ability of impaired users to understand them too. These two methods will combine effectively to simply the messages images convey to Instagram users but most helpful to those with visual impairment. 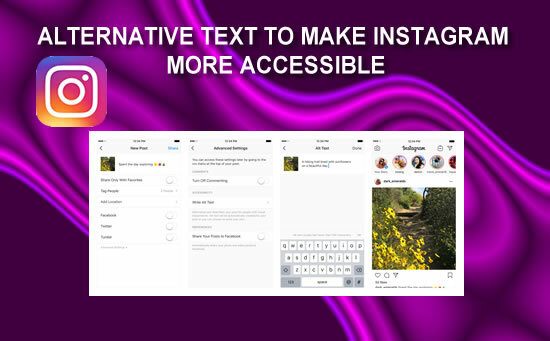 Using machine learning, Instagram will be able to detect the context of an image and use that to add alt texts automatically aimed at interpreting the image to users. Not only will this approach add automatic alternative texts to images, but it will also provide a description of photos for screen readers. While using the Instagram app, screen readers will then be able to list each of the objects or items a particular photo contains. While automatic alt texts will provide a description of images without one, the manual alternative text allows users to enter this text on their own to provide more information about the photos they upload. This feature will be available at the point of uploading a new photo. Similarly, photos that have been uploaded can be edited by the user during which an alt text will be provided. What matters here is that the user will have to provide a description of the images uploaded to the platform. With that, “people using screen readers will be able to hear this description”. What would have been a major concern with the manual input is the relevance of the description users will provide. However, the object recognition technology will complement this feature to help everyone understand the context of photos being viewed. Whilst alt text is just one out of several accessibility features available to web users and devices, it’s a good step towards introducing others. Whether they are immediately introduced or as a gradual process, these features will richly improve the usability of Instagram and the accessibility of its contents. Most importantly, every user will be able to understand the type, nature and meaning of content uploaded to the platform irrespective of their state of health.